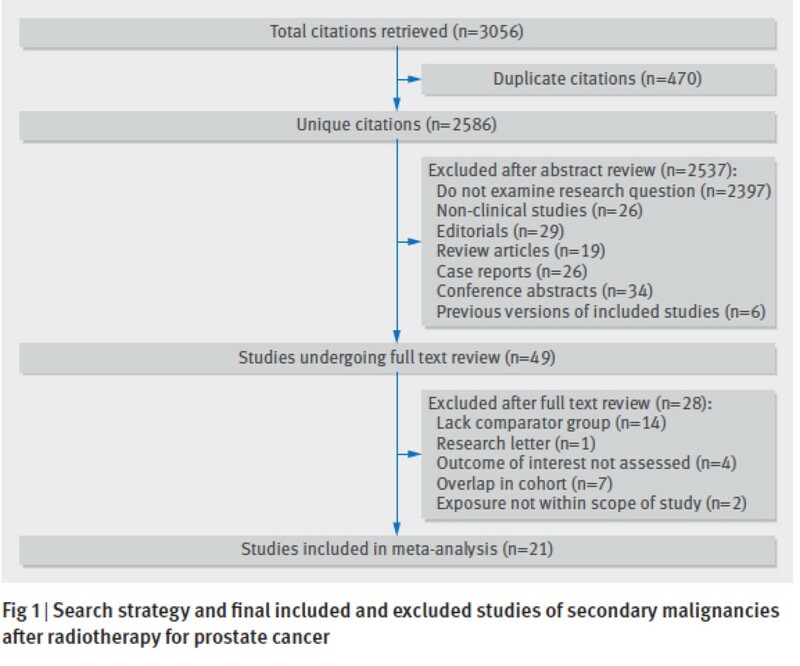 March #urojc: Radiotherapy for Prostate Cancer – Is it a gift that keeps on giving? The International Urology Journal Club on Twitter is now well into its 4th year. The subject for the March 2016 discussion was a paper published in the BMJ entitled “Second Malignancies after radiotherapy for prostate cancer: systematic review and meta-analysis”. Lead and senior authors, Chris Wallis and Rob Nam were kind enough to make themselves available to participate in this discussion. Rob Nam made use of the #urojc guest twitter account. The literature was searched using Medline and Embase and the method of review was the Preferred Reporting Items for Systematic Reviews and Meta-Analyses (PRISMA) and Meta-analysis of Observational studies in Epidemiology (MOOSE) guidelines for reporting of this systematic review and meta-analysis. Chris Wallis provided an excellent TL:DR summary with the following tweet. It is well recognized that secondary malignancies following radiation exposure could take many years to become apparent. The responses were fairly predictable but nevertheless an important point to explore. Early in the discussion, there was also relevant reminder of the issue of differences in odds ratios and absolute risk. That said, consideration needs to be given to the ‘big ticket’ nature of secondary malignancy where even a small absolute risk drives a great deal of interest in this subject matter. An interesting finding from the study was that the risk of secondary malignancy was less with brachytherapy compared with external beam radiation. Further to this, is it possible that there could be a difference between HDR and seed brachytherapy? An interesting thought although not specifically covered in the paper. A more controversial aspect to the discussion was whether the risk of secondary malignancy would justify screening or surveillance. The following exchange was worthy of note. Whilst there is nothing in the way of documented guidelines or actual evidence to demonstrate a benefit of surveillance, it seems something worthy of consideration for future practice guidelines – in other words, recommendations one way or the other. Rob Nam refers to a third paper on radiation outcomes in the context of previous surgery. This BJC paper, the Lancet Oncology paper (previous discussed at a #urojc in 2014) and now the current paper could cheekily be called the Nam Trilogy – make note that you heard this term here for the first time. To what extent should we be counseling our patients on the risk of secondary malignancy if they are to undergo radiation for prostate cancer? Is this just another factor to encourage surgery over radiotherapy? Will there be no change in practice, particularly in the US where many lucrative radiation oncology services are actually owned by urological surgeon private practice groups? The state of radiation oncology practice is different outside the US and my own personal thoughts on the matter are that the Nam Trilogy of papers will create a series of well cited ‘evidence’ that will further shift the weight of opinion towards surgery over radiotherapy as a primary treatment for localized prostate cancer. 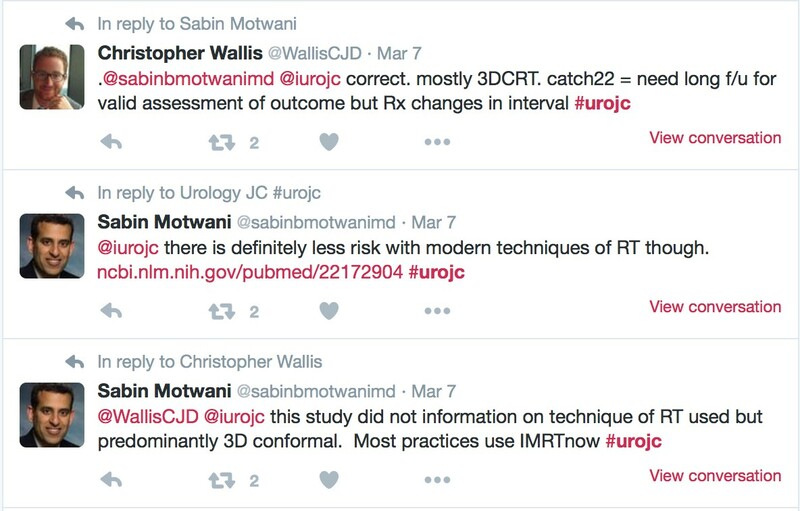 Anybody who followed the March installment of the #urojc would have been impressed by the high level of interaction by the authors Chris Wallis and Rob Nam. A particular mention should be given to Sabin Motwani who as a radiation oncologist, provided valuable input to the discussion. Please do join us for the April installment of the #urojc and I encourage you all to email, tweet or DM your suggestions for papers to be discussed. Please also, feel free to volunteer to write up a monthly summary for publication on the BJUI blogs. I would also like to acknowledge the contributions of Rustom Manecksha who was the winner of the 2016 BJUI SoMe Award for #urojc – a reflection to the quality of his participation and support for this online educational activity. Henry Woo is an Associate Professor of Surgery at the Sydney Adventist Hospital Clinical School of the University of Sydney. He is the coordinator of the International Urology Journal Club on Twitter. Fantastic discussion and a pleasure to be involved. As an author participant, your contribution to the discussion was exceptional. Your insights demonstrated just how valuable it is to have author input at a journal club discussion. Thank you for the opportunity to participate in this month's #urojc. I enjoyed sharing a balanced perspective and discussion on the merits and risks of radiation therapy for prostate cancer.